Minister Bennett tours Gaza perimeter, refers to negotiations on possible 'hudna' and issue of Overrule Clause. 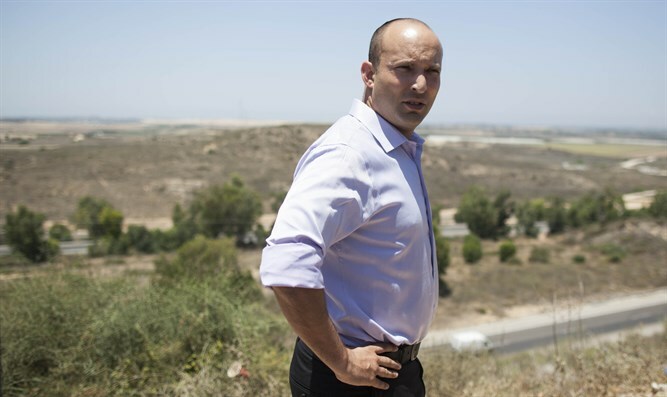 Education Minister and Political-Security Cabinet member Naftali Bennett visited the Gaza perimeter this morning against the background of the tense security situation in the southern sector. Minister Bennett met with Eshkol Regional Council head Gadi Yarkoni for a tour and observation of the Gaza Strip. Bennett is also expected to visit the Nofei Habesor High School and hold a working meeting with council management and school principals. "We support the rehabilitation of Gaza, we have no quarrel with the residents of Gaza, provided our sons return home and under the auspices of that Hudna the terrorists will not rearm," Bennett said. On the issue of the Overrule Clause, Bennett said, "It's also important to solve the problem of infiltrators and to restore the judicial system to its role: The government will govern and the judges will judge. "Two months ago, the Prime Minister personally made a number of commitments to pass an Overrule Clause, and recently he claimed our preoccupation with the issue subverted it. So we moved aside to allow him to bring up the Overrule Clause as he promised and to respond to the infiltrator crisis. We'll continue to push this, we need no ultimatum at this stage. I expect that if the Prime Minister promised he will also deliver." In response to a question by Arutz Sheva on the subject of dealing with incendiary kite terrorism, Bennett replied, "Just as we knew how to solve the tunnel problem and to a great extent also solved the problem of rockets, so will we solve this problem."